Home Random Stuff Blog Ragnarok M: Eternal Love collaborates with… Evangelion!? 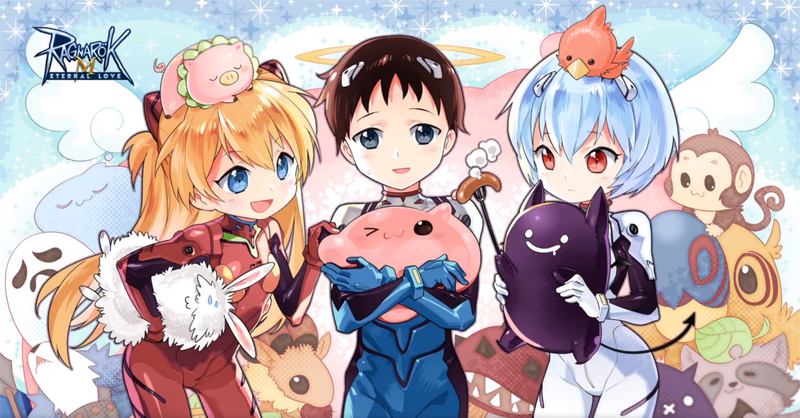 They even remade the Eva intro in Ragnarok style! Well this was unexpected! Ragnarok M: Eternal love recently announced a collab event with the ever-popular anime franchise Neon Genesis Evangelion. The collab is entitled Ragnarok M x EVA | Children Awakening Program, and to celebrate, Ragnarok M released a teaser video which basically recreates Eva’s opening, but in the game’s signature style. Ragnarok M x EVA | Children Awakening Program, the adventure made just for you. Five main characters across the universe to meet you! Unit-01 and Unit-02 have landed successfully. The law and order of Rune Midgard are guarding by us!! The Introvert Shinji Ikari, the straight forward Asuka Shikinami Langley, the feelingless Rei Ayanami, the mysterious Mari Makinami, and the youth that awakening on the moon Kaworu Nagisa. Do you still remember when you were watching Evangelion back in the day? Time flies, we will always be passionate. Make your dream come true, to create your journey of the future! The Ragnarok M Eva event is live now and will run until February 28, 2019. As you may have guessed, the collab features a limited-time Eva-themed event along with cosmetic items that are either unlockable or available through the gacha. For more information on the Ragnarok M x EVA | Children Awakening Program, click here.